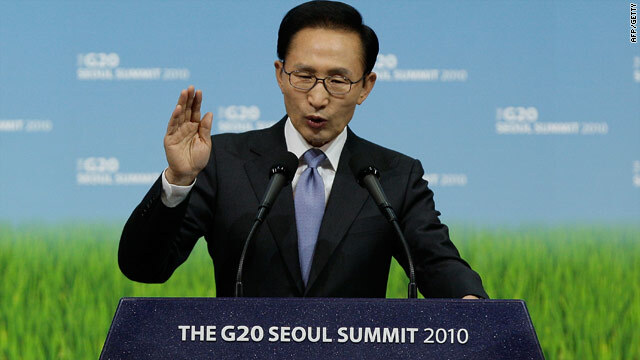 S. Korean President Lee Myung-bak -- pictured talking at the Seoul G-20 summit -- said the provocation was like an invasion. The United States calls the shelling "belligerent action"
(CNN) -- Nations reacted swiftly Tuesday in condemning a North Korean artillery attack that South Korea said killed two marines and wounded 15 soldiers and civilians. The strongest reaction came from South Korean President Lee Myung-bak, who ordered his military to punish North Korea "through action," not just words, the official Yonhap news agency said. "The provocation this time can be regarded as an invasion of South Korean territory," Lee said during a visit to the headquarters of the Joint Chiefs of Staff in central Seoul. "In particular, indiscriminate attacks on civilians are a grave matter." The United States also offered quick comment, with the White House saying it "strongly condemns" the "belligerent action" by North Korea. Pentagon spokesman Col. Dave Lapan said Defense Secretary Robert Gates was scheduled to speak with his South Korean counterpart Tuesday morning. "Obviously we're in close contact with U.S. forces, Korea and our allies there in monitoring the situation," Lapan said. U.S. forces in the area have taken no additional measures, he said. "Right now it is too soon," Lapan said, adding, "At this point it is premature to say we are considering any action on this. "Any incidents like this we view with concern. They certainly increase tensions on the (Korean) Peninsula." Japanese Prime Minister Naoto Kan's Cabinet is to meet Tuesday night to discuss the regional situation. "The artillery attack carried out by North Korea today was unpardonable and the Japanese government strongly condemns North Korea," Chief Cabinet Secretary Yoshito Sengoku said in a statement. "This provocation by North Korea compromises the peace and security of not only South Korea, but also the entire region of North East Asia, including Japan," the official said. "Japan demands North Korea to stop such action immediately. Based on prime minister's orders, Japan will take appropriate measures in close coordination with [the] U.S. and South Korea, as well as other related countries." Indonesian Foreign Minister R.M. Marty M. Natalegawa also expressed his nation's "deep concern." "Indonesia calls on both sides to immediately cease hostilities, exercise maximum restraint and avoid further escalation of tension," Natalegawa said. Chinese Foreign Ministry spokesman Hong Lei said China had taken note and expressed its concern. "Relevant facts need to be verified and we hope both parties make more contributions to the stability of the peninsula," he said. 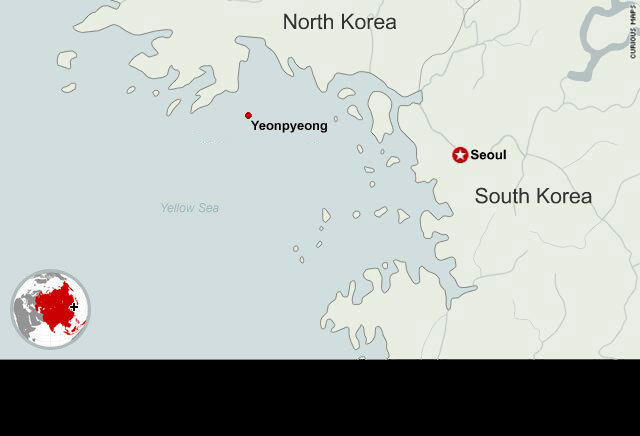 Russia's Interfax news agency said Russia condemned North Korea's artillery shelling, pointing out that "those who initiated the attack on a South Korean island in the northern part of the inter-Korean maritime border line assumed enormous responsibility."